Sometimes — like right now — it’s simply too hot to cook. What we’re hoping for is a break in the heat, perhaps a day of soaking rain, a couple of pleasant hours to get outside and do the yardwork, then a big salad and a tall, cool drink for supper, and a terrific frozen treat to finish off the evening. I’ve been inspired by the weather this July (and likely August, as well), to keep it simple; we’re making lots of salads now — Greek salad with feta and cucumbers, Mexican black bean salad with cilantro and peppers, and lots of different cold pasta salads with poached salmon, grilled chicken or hard-boiled eggs. It’s just too hot to cook. With that in mind, what I present to you this week is some ideas for wonderful cool, sweet fruit treats using seasonal fresh and local fruits available from all your favorite markets. I’ve pulled out our ice cream maker, and we’re enjoying the rich bounty of what Lancaster County does best: sweet fruits for hot summer evenings. Watermelon and peaches are at the peak of perfection now, and if you’ve prepared ahead, you’ll likely have some frozen blueberries from last month’s harvest. Additionally, making fruit sherbets and ices are a fun way to get the kids involved in food planning and preparation. Nothing is likely to pull them into the kitchen faster than the anticipation of homemade frozen dessert treats. 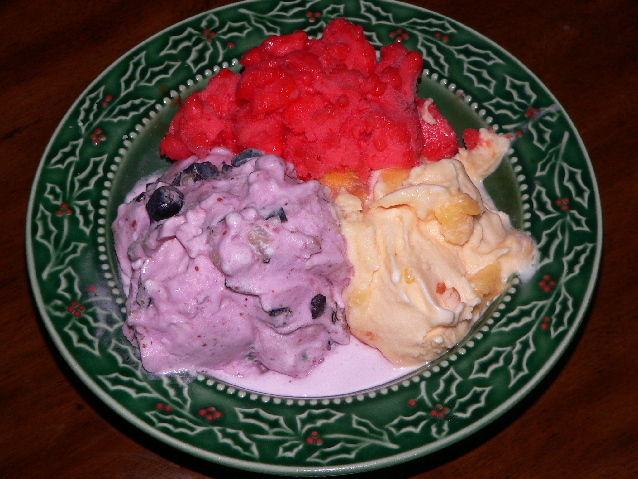 Also, if you want to skip the ice cream maker entirely, simply freeze the fruit purees and then shave the icy result into bowls for an intensely flavored granita. And if these recipes don’t get your attention, keep in mind that any of them can be altered to suit your taste. You can use strawberries, raspberries, nectarines or plums, mangoes and melons of all sorts. Even oranges, lemons and limes make wonderful frozen desserts. Try these recipes or adapt any one of them to your favorite fruits. In a large bowl, combine watermelon, sugar and lemon juice. Chill for 30 minutes; place half in a blender and blend until smooth. Pour into a large bowl and repeat with the remaining watermelon mixture. In a saucepan, dissolve the gelatin into the water; add to watermelon mixture. Stir in the milk until all the ingredients are well-blended. Chill the mixture for 2 hours. Freeze in two batches in an ice cream maker according to the manufacturer’s directions. Serve immediately or freeze overnight and defrost for 10 minutes before serving. Place the peaches (reserving 1/2 cup), lemon juice and salt in a blender and whiz until smooth. Warm 1 1/2 cups of the milk in a saucepan over low heat, add the sugar and stir until completely dissolved. Pour into the blender with the peach mixture and add the remaining milk. Blend thoroughly and refrigerate four to 24 hours. Whisk again and freeze in an ice cream maker, adding the reserved peach pieces in the last minute. Serve immediately, or transfer to a tightly sealed container and freeze overnight for a better, ripe ice cream product. For a tangier product, replace 1 cup of milk with crème fraiche or plain yogurt. Process the ingredients in a blender until smooth. Pour into an 8×8 baking pan; cover and freeze 4 hours or until firm. Process the frozen mixture, in batches, in a blender until smooth; turn into a tightly sealing plastic freezer container and freeze another four to 24 hours. Defrost 10 minutes before serving.